Have you ever considered making your own sausage or bacon? What about curing and smoking your own hams? 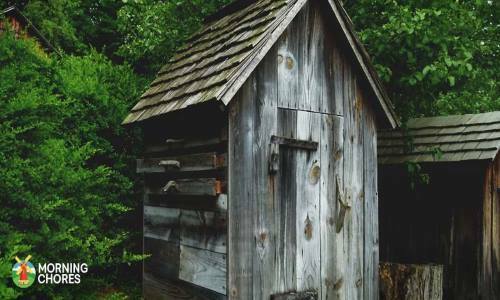 Well, if any of these ideas have ever fascinated you, then you might want to consider building your own smokehouse. But what if you are on a budget? And I mean a tight one! Then you can do what we did. We built a smoker this week, and by utilizing the materials we had lying around, we were able to build this smokehouse for about $20. Now, I realize you may not have all of the same materials, but you may be able to use this as a jumping off point to utilize materials you have just hanging around. But even if you bought all of the materials brand new, you wouldn’t have a huge expense on your hands. The biggest part of building a smokehouse is deciding on where you are going to locate it. After lots of research, we learned that placing it somewhere in the shade is the best option. Basically, the reason is that when you have meat hung in a smokehouse you don’t want to worry about the sun making the temperature fluctuate too much. This can actually cause your meat to ruin. So when choosing a location, you’ll want to make sure that you choose a spot where there will be some protection from the sun. For us, we chose to place our smokehouse near the tree line so it would still get some protection during the winter, but that it would definitely be shaded during the warmer months too. 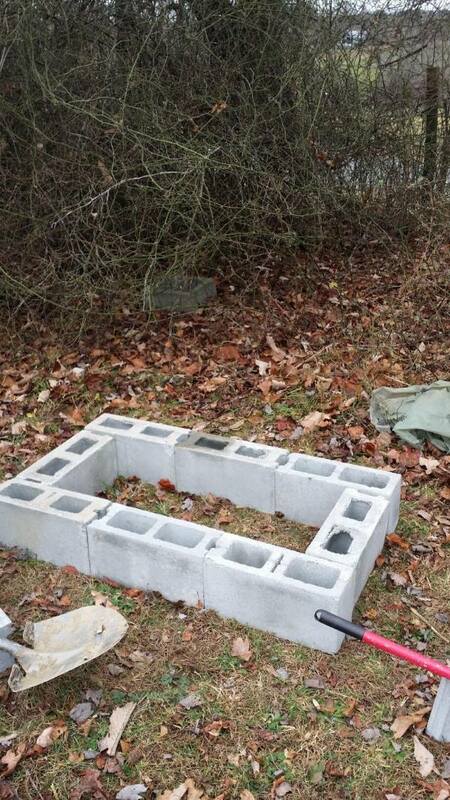 This whole process started by laying out our cinderblocks. We had these on hand from our previous homestead. We had ordered a huge shipment of cinderblocks to finish out a foundation project on our old home. So when we moved we brought all of the leftover materials we had. We put some of them to good use on this project. 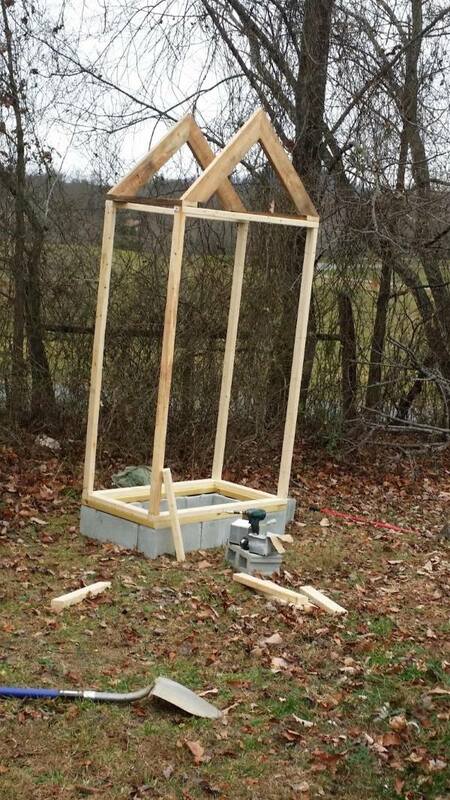 Now, we ended up making a 4ft by 2ft smokehouse. The smaller the smokehouse, the more effective it is. Granted, it won’t hold as much meat, but I’m looking to feed a family of 5 so I don’t plan on smoking a ton of meat at one time. However, back in the old days, people had much larger families that all lived very active lifestyles on the farm. So obviously, they required a lot more food and smoking and curing meat was a great way to provide for their nutritional needs. Just keep all of this in mind as you are deciding on how large a smokehouse you really need. The next step is to frame the base. We began by framing the bottom of the base with pressure treated 2×4’s. Then we made a ring over the top of that with non-pressure treated 2x3s. It is recommended that smokehouses are made with non-pressure treated wood. The reason is when they heat up, you don’t want any chemicals being released from the wood and into your food. However, we knew that the bottom would have moisture draining down on it, so it needed to be protected. But since the pressure treated wood was at the very bottom of the smokehouse and covered, it releasing chemicals into the food should not be an issue. Next, you’ll use the 2×3’s to build up the frame of the building. You’ll need to have a vertical piece at one front corner, a vertical piece at the other front corner, and then a horizontal piece connecting the two. Then you’ll do this on the backside of the building as well. You’ll finish this step by cutting 2 more horizontal pieces of wood to length out of the 2×3’s to connect the front and back section of the building. Now that you have your building standing upright, it is time to create the roof. You’ll cut your 2×6’s to create the type of peak that you’d like for your roof. You’ll need to create identical peaks for both the front and backside of the smokehouse. Then you’ll use the scraps left over of the 2×3’s to make bracing for your roof. You’ll place them evenly across the roof with screws to support the metal. Once your bracing is done, you can apply the sheets of 8-foot metal. You will have to cut them to size and secure them with screws. Now, you may be wondering about adding a vent to the roof. We added a piece of flashing across the top of the roof. This will allow the roof to vent the smoke. So we didn’t have to add an actual pipe vent out of the top of the smokehouse. It made this project so much easier. Now that your roof is in place, it is time to brace the structure. You may notice at this point that the building can still move around on the cinderblocks, and it feels a little flimsy. Well, you’ll want to use some 2x6s. You will cut them to size and place 2 braces on each side of the smokehouse and the back of it. You can see from the picture how we spaced ours for optimal support. Again, you’ll have to secure these with screws. Once they are in place your building should feel less wobbly. We will take care of the base moving on the cinderblocks in a later step. This was the interesting part. We actually found these old sheets of metal in the wooded part of our land. The previous owner had purchased them for a project and just left the remains. However, when you go to cover your smokehouse, it can get costly. I would like to eventually go over our smokehouse with cedar, but for now, this is going to work just fine. So you’ll need to cut your metal for the back first. You’ll have to do some fine tuning on your trimmings, no doubt, because of the peak of the roof. It took us a few tries but eventually, we got everything to fit together. Then you screw the metal in place. We used 3 different cut pieces of metal across the back to get it fully covered. 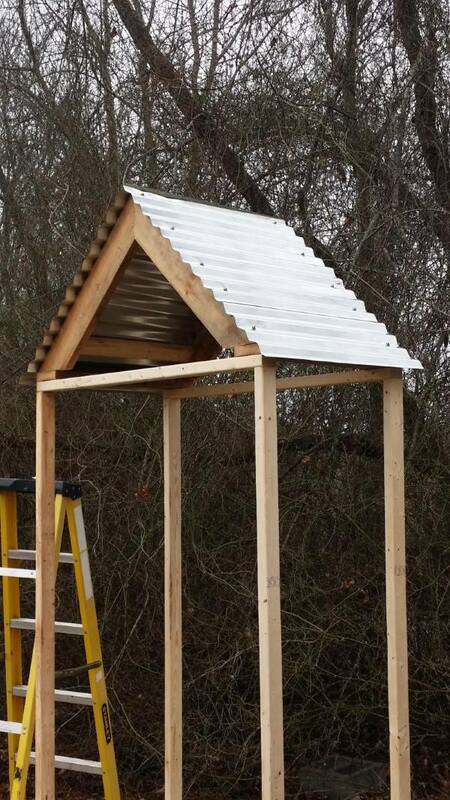 Next, we covered the side of the smokehouse with 2 different cuts of the metal. Then we had some excess metal hanging over the side from the back of the smokehouse. So we decided to splice it in certain sections so it would be easier to bend. We folded it over so it would cover the exposed wood on the sides and give the corners a more finished look. We secured the flaps of metal with screws to the side of the smokehouse. Once this is done, you are ready to move on to the finishing touches. We actually built our smokehouse door. 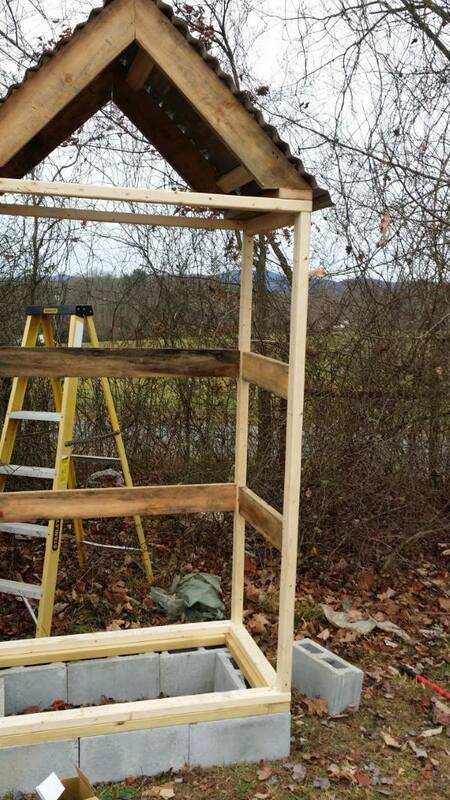 We had an old chicken coop on our property that hadn’t been used in years. We have been slowly taking it apart and making new things with it. So it was created out of rough cut wood, which is where our rough cut lumber came from. We then measured the doorway and cut the wood to size. Then the pieces of wood were screwed together to make an actual door. Next, we put flashing in the doorway to protect it from any water. Then hung the door on hinges using the gate set. From here, we had a smokehouse that was ready to function. Now, there are a few finishing touches that will need to be made to your smokehouse. The first of these touches is paint. Where we used old rusted metal, if I don’t want it to keep wearing down, I’ve got to use a wire brush and knock all of the rust off of it. Then I’ve got to prime the building and paint. This will help protect the metal from being destroyed. I haven’t quite gotten there yet because in the middle of our building project what was supposed to be a ‘light dusting’ turned into a few solid inches of snow. So once the weather clears, I’ll finish the painting. Also, you are going to want to add some shelves or hooks to make hanging meat in your smokehouse a little easier as well. This is the part that is easy and lots of fun, in my opinion. You use a few bags of quick-drying concrete and dump them in a wheelbarrow. Then you’ll mix them with water and a hoe until it is the desired consistency. From there you’ll pour the concrete into the smokehouse. 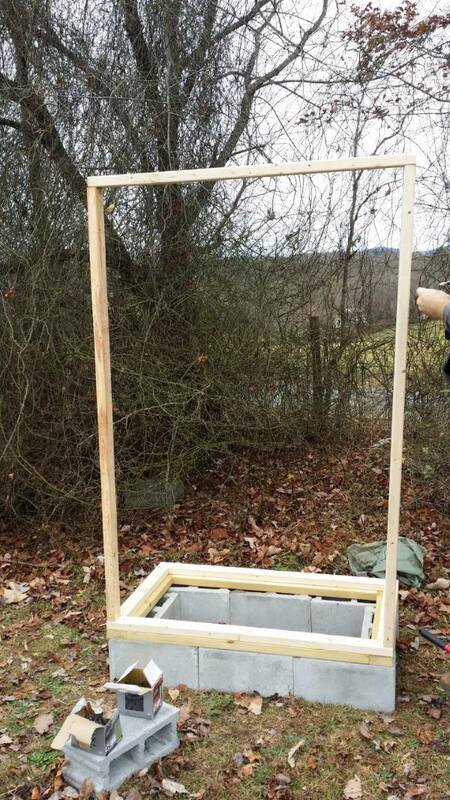 Your goal is to fill up the cinderblocks and go around the edge between the cinderblocks and the wooden base of the smokehouse so that the smokehouse will have a secure foundation. Finally, you can’t have a smokehouse without smoke. You can do this multiple ways. You can use a wood stove that is attached to the smokehouse through a vent. Or you can use propane. To begin, because we need to be able to cure and smoke hams in a hurry, we are going to use propane. But I’m planning on writing a follow-up article on this about how we are creating our own outdoor woodstove from a barrel to work for our smokehouse. As long as you can get the smoke to your smokehouse, you’ll be in business. 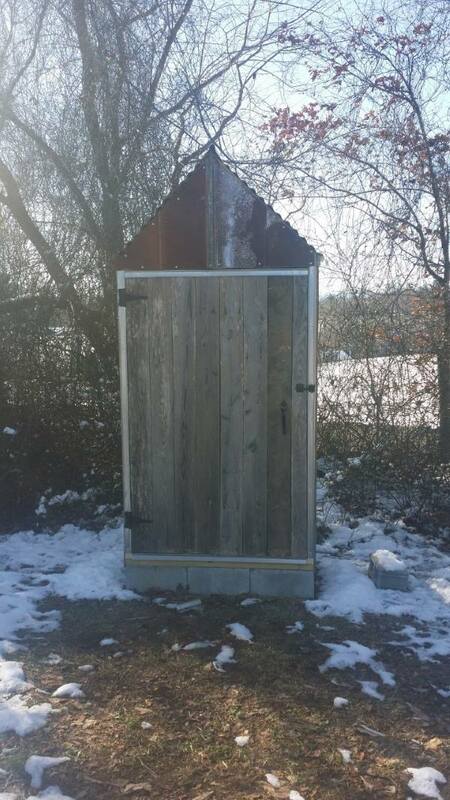 So you now have instructions on how you can build an inexpensive smokehouse with cheap materials or even materials you may already have hanging around your property. But now I want to hear from you. Do you have a smokehouse on your property? Do you have any pointers for someone wanting to build one from upcycled materials? Next PostFreezing and Food – Do They Go Well Together? I have got best wheelbarrow ever from this post. After read whole review i think worx aerocaart would be best choice for me for gardening loading work. Yes you are absolutely right , i am impressed after read your full article. how would you attach propane to make this work. does the burner need to be inside the smokehouse.